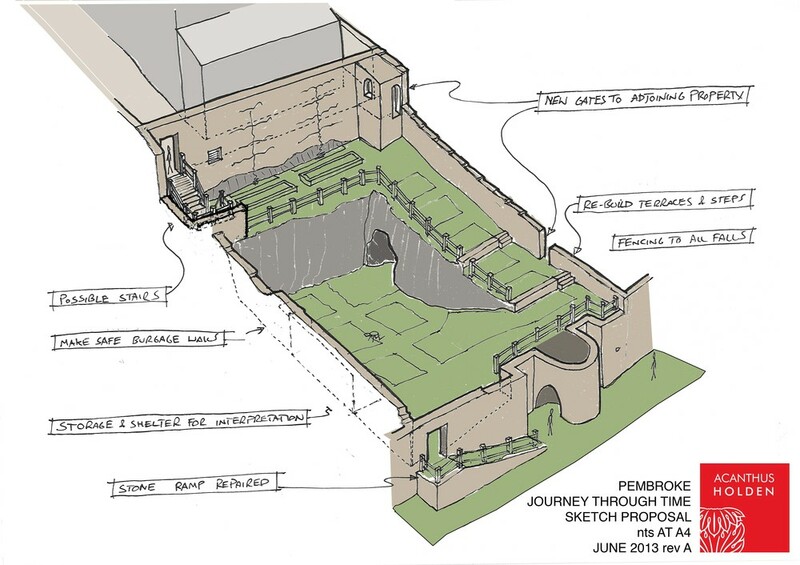 A community garden scheme just the first phase in a campaign to bring Pembroke’s medieval walls back into good repair. A suitable site for a pilot project has been identified to the rear of the Tabernacle United Reformed Church on Main Street. The church is currently being used for a number of community based activities, and Pembroke 21C Community Association have established it as a base for The Pembroke Story heritage project. The Pilot Project will be linked to A Journey Through Time, an innovative and important project for Pembroke being developed by Pembroke 21C to enhance The Pembroke Story and create a heritage community garden. Based within the burgage walls of the Tabernacle Church, and incorporating a section of Town Wall, the Limekiln and a cave, this project is a partnership which will link the commons with the Main Street through the town walls, the garden and the church.